WASHINGTON (AP) — The U.S. special envoy is back. The Trump administration, which had steered away from appointing high-level diplomats to focus on particular world trouble spots, is now embracing the concept to run delicate negotiations for Syria, Iran, North Korea and now Afghanistan. Secretary of State Mike Pompeo said Tuesday he will name Zalmay Khalilzad to be special adviser for Afghanistan. Khalilzad is the fourth such envoy named in the past month, following Brian Hook, who will handle Iran policy; James Jeffrey, who will run Syria policy; and Stephen Biegun, special representative for North Korea. “Ambassador Khalilzad is going to join the State Department team to assist us in the reconciliation effort, so he will come on and be the State Department’s lead person for that purpose,” Pompeo told reporters as he flew to Pakistan and India with his new hire. The appointments are part of a hiring spree under Pompeo to fill vacant posts. Pompeo has made a point of reaching out to veteran diplomats and foreign policy experts who served in past Republican administrations. They are being tasked with intractable foreign policy problems. 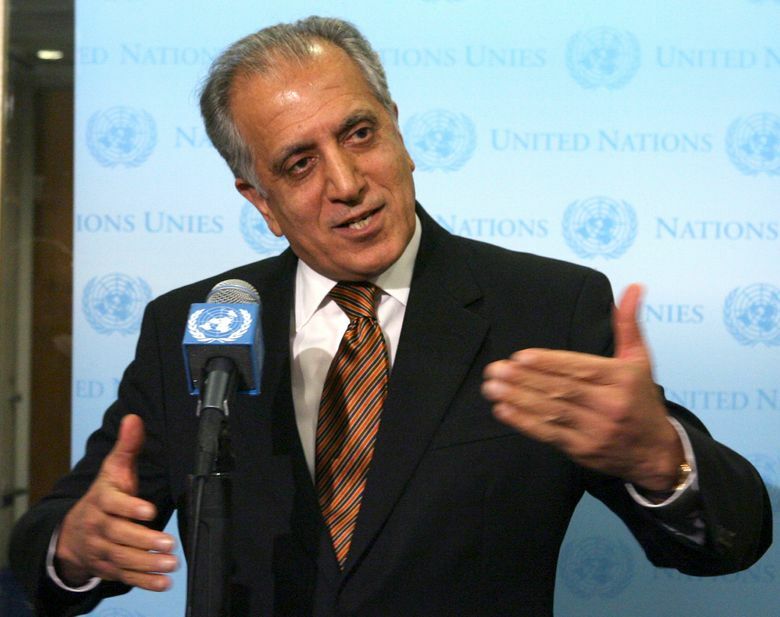 Khalilzad is a native of Afghanistan who was educated at the American University in Beirut and the University of Chicago. President George W. Bush tapped him to be his Afghanistan envoy after the Sept. 11, 2001, terrorist attacks, and then as ambassador to Iraq and the United Nations. He was considered for secretary of state by the Trump transition team, notably after introducing then-candidate Donald Trump at his first major foreign policy speech during the campaign. Khalilzad is currently president of an international business consulting firm, Gryphon Partners. He will be charged with integrating Afghanistan into the administration’s Indo-Pacific strategy and dealing with an Afghan-Taliban peace process that has struggled to get off the ground as the insurgents escalate attacks and demand direct talks with the United States rather than the government in Kabul. He is accompanying Pompeo on a visit to India this week. “Khalilzad’s appointment means the administration will have a senior official in place with a singular focus on reconciliation. But Khalilzad’s harshly critical views of Pakistan suggest that Islamabad could be left on the outside looking in, if a reconciliation process is to be launched and move forward,” said Michael Kugelman, senior associate for South Asia at the Wilson Center think tank. The appointment of special envoys is part of Pompeo’s self-described mission to restore “swagger” to the State Department, which suffered significant losses to its senior ranks under his predecessor, Rex Tillerson. More than 70 positions at the department — including ambassadorships, undersecretaries and assistant secretaries of state who are critical to framing and executing policy — were vacant when Pompeo took office in April. Department spokeswoman Heather Nauert said special envoys bring a “singular focus” to complex foreign policy challenges and “the authority to cut across agencies and regions in order to advise the secretary on the overarching strategy.” They ensure that all expertise within the department is brought to bear, she said. Tillerson eschewed special envoys. He eliminated many existing positions, grudgingly appointing people to posts mandated by Congress and creating just one during his brief tenure as secretary of state: Kurt Volcker, who is working on Ukraine. In reducing positions dedicated to a specific country or policy area, Tillerson was following the lead of Bush’s first secretary of state, Colin Powell, who cut a host of special envoys that had been created during President Bill Clinton’s two terms in office. Powell, like Tillerson and many in the GOP foreign policy community, was skeptical of the value of special envoys, especially because they required their own staffs and generally operated independently of the State Department’s six geographic bureaus that cover the Africa, East Asia and the Pacific, Europe, the Middle East, South and Central Asia and the Western Hemisphere. Some 30 ambassadorships still remain vacant, including those to Mexico, Pakistan, Turkey and Saudi Arabia, according to American Foreign Service Association records. But recent appointments have signaled Pompeo’s willingness to bring in Trump critics who had previously been shunned for top roles, making it difficult to fill vacancies with experienced candidates. Jeffrey, the new special envoy to Syria, is a well-respected retired ambassador who holds the highest rank in the U.S. Foreign Service. He was among dozens of former GOP-affiliated diplomats and national security officials to have signed a public letter during the 2016 presidential campaign saying they would not vote for Trump and declaring him unsuitable for the White House. When Hillary Clinton took over as America’s top diplomat after the election of President Barack Obama, she embraced special envoys with gusto, creating a slew of positions and appointing Democratic-aligned politicians and analysts to fill them. Those included the late Richard Holbrooke to be special representative for Afghanistan and Pakistan.